Sister Virginia Schroeder was born in Salem, Oregon, to Al and Clara Schroeder. Growing up there, she attended St. Vincent’s School and Sacred Heart Academy where she became acquainted with the Holy Names Sisters. In 1963, she left Salem, her parents, her sister Louise and brother Don, to join her sister Marilyn in the Holy Names Community. She received the name Sister Urban Mary (after her uncle Father Urban), made vows, completed a degree in education, and went to teach in elementary parochial schools in Portland, Coos Bay, and St. Helens. Like many Holy Names, she expected elementary school teaching to be her life’s work, but next came secondary school ministry at LaSalle High School, Milwaukie, and St. Mary’s Academy, Portland. 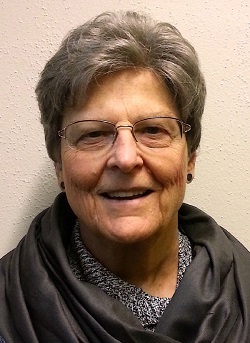 Then, armed with a master’s in pastoral studies from Seattle University, she began a career working in parishes including Holy Trinity, Beaverton; St. Alice’s, Springfield; St. Jude’s, Eugene; St. Mary Star of the Sea, Astoria; and The Madeleine, Portland. Her extensive work experience prepared her for her mission at Mount Angel Seminary where she served as Assistant Director of Pastoral Formation and Director of Admissions. The seminary honored her with the St. Michael the Archangel Award for exceptional fidelity and commitment to the mission of the seminary. Retirement was not the end of Virginia’s ministry. Currently she is hospitality coordinator of the Historic Laundry Building at Marylhurst, hosting groups of Sisters and sometimes their families and friends. Additionally she serves as Co-director of the Oregon Associates, planning meetings and retreats for them. And what does she do in her spare time? Virginia enjoys shopping for the Sisters at Mary’s Woods, and helps Sisters organize and downsize when they need to move. She quilts, does cross stitch, reads, and walks daily. Each week she helps in the Refugee Resettlement Office of Catholic Charities. She also volunteers at St. Andrew’s Emergency Center and periodically answers phones for OPB radio. In all these, she maintains her great devotion to Blessed Marie-Rose. Virginia remains deeply grateful to the Holy Names Community for the many opportunities and experiences she has had. She is also most grateful for the wonderful example of the Sisters at Mary’s Woods.